Pink Macaron Necklace and Discount Code! Christmas Jewelry Gifts - Pre-order now! 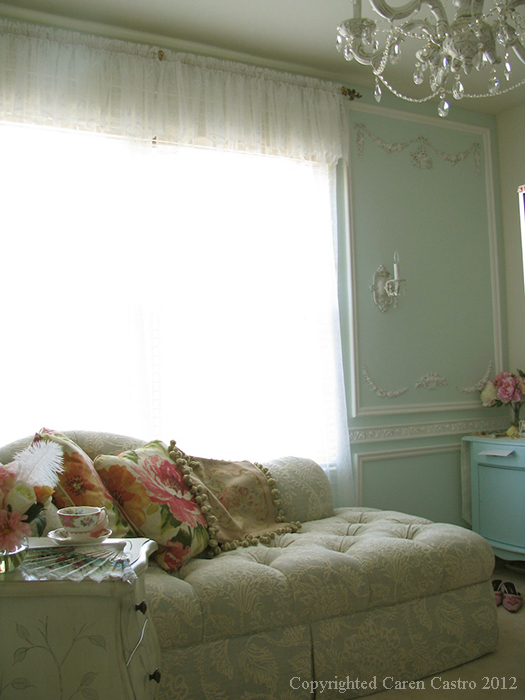 Come visit my new friend's Marie Antoinette Room! I had the pleasure knowing Caren when she approached me for some fake macarons. Initially I didn't know how those fake macarons would be used for (they are still in the midst of making by the way) but curiosity got the hold on me. 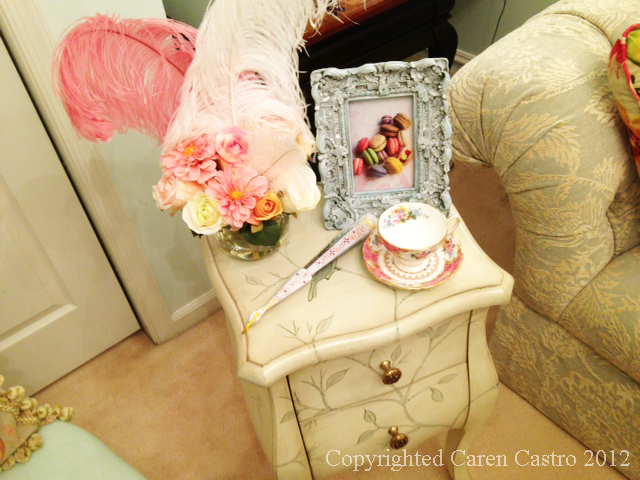 I'm always curious how my customers use these fake macarons :) Caren told me she wanted to decorate her Marie Antoinette inspired room with them, and she shared some precious photos with me. I asked Caren if I could possibly share these photos on my blog and I'm so glad she allowed me to, so a very BIG thank you to you, Caren!! Don't you just love the colour of the wall and all the intricate patterns on the wall? I love it! Even the fabric print of the chair matches! The lounge chaise looks incredibly comfortable. Would you enjoy reading a book or napping on it? More work are planned for this room, so perhaps in the future, I might be able to show you more photos! I'm thrilled when I finally own it, and was even more delighted when I finally started working on it about 2 months ago. If you had been following my blog, you'd know that I fell head over heels in love with this one. When I finally got my hands on the chart, I started digging through my stash for the light pink fabric (as recommended) to stitch on. Just amazingly enough, I have a pink fabric in my collection and the size was just perfect for it. However as I have been keeping the fabric for a long time, it has a few yellow spots here and there, so the first thing I had to do was to wash and remove the yellow spots which I did successfully by washing and using some fabric stain remover. Some folks said baking soda would help too but I don't have that at home, so I just tried using what I have at home. My progress has been slow but I'm glad this is a easy chart to stitch. They consist of all full cross stitches so it's very enjoyable too. I'm currently working on the cupcake, and once I'm done, I'll move onto the right hand side of the chart! How was your Christmas? I hope you had a great one spending quality time with your loved ones. I worked on Christmas Day ;) But it was not tough, and I had fun chatting with my student who had not been able to come for class for a while. After that, I went to my aunt's place for family gathering and we had a nice Christmas spread for dinner. It was delicious! Oh and I pampered myself with some christmas presents too which finally arrived in the mail. Some skincare items which I will be using religiously, plus these are perfect for traveling too since they don't take up too much space. I should take a photo of my cross stitch project soon too, which I started 2 months ago? Maybe for my next post! Hi all, just a short note that a wide assortment of macaron jewelry is now available in person in Unicorns In Love situated in Alice Springs, Australia! Details about her shop is updated in my retail shops page. This week I was in the mood for a little painting and decided to paint this cute bunny on my macaron. I am pleased how it turned out. I love bunnies although I have never had one before. They exude such calm elegance. There might be another design soon. Do look out for it! These new batch of macaron ornaments are freshly whipped and I'm so glad they are finally dried. The weather has been very wet lately which slows down the drying time tremendously. I truly love this shade, which is a bright cherry red which just makes me smile. I'm going to offer this colour in my shop just because I think it's lovely. I know it might be a little late but well, there's going to be Christmas every year no? This cute shabby dollhouse decor has the word "Home Sweet Home" printed on it. I know, sometimes I just get a little crazy playing with my own creations, but it helps to fuel my creativity too! I don't have a dollhouse but I can still enjoy playing miniatures, or taking them out to appreciate their tiny beauty and intricacies. With that, I shall leave you with this picture. I have many dollhouse decor signs I want to make, and we'll see how many I can come up with! Initially piping the snowflake on these was not in the horizon, but I guess it was just the matter of time that we decided to go for it. I'm so glad this turns out beautifully, and I'm liking these red macarons a LOT right now. Looking at it just makes me happy because the colour is so christmassy! If anyone fancy some of these, pop me a note! I made some stollen bread earlier in dollhouse miniature 1/12 scale for my christmas scene. Though I've not tasted this before (I'm not a fan of anything with cinnamon in it), I saw this christmas food a few years back in one of those high end bakery stores here and I was fascinated with this irregular shape bread. Candied fruits, nuts and spices are just some key ingredients in this traditional german christmas food. I made these in dollhouse miniature scale, and hand wrapped them individually. Right now, these individually wrapped stollen breads are available in my shop here or Etsy shop. I saw these Martha Stewart Satin Acrylic Paint by chance when I was browsing the local art and craft store just recently. I ran out of some paints and was looking to pick up my usual when I saw these. I was delighted when I saw them as the colours were extremely beautiful! But you must know I wasn't a fan of Martha Stewart other products...such as the air dry clay. You can see my earlier blog post here. Because of that, though I was mesmerized by the whole range of soft shades which was calling out to me, I held back and decided not to be an impulsive shopper. Standing at the rack for a good half hour and more, with a sales staff right beside me refilling the paint racks with the Folkart paints, I was still deciding on which ones to get. Finally I decided to get only the basic colours to try out - White and Beige since these are colours I use a lot and from there I can review it. They have Satin, Gloss, Metallic and one more which I don't remember. I was lured by the Satin paint. The other brands don't have a Satin paint, so I was very curious to what it would do. The prices are also a bit more expensive than Folkart and other brands, so perhaps some people might be concerned with the prices. 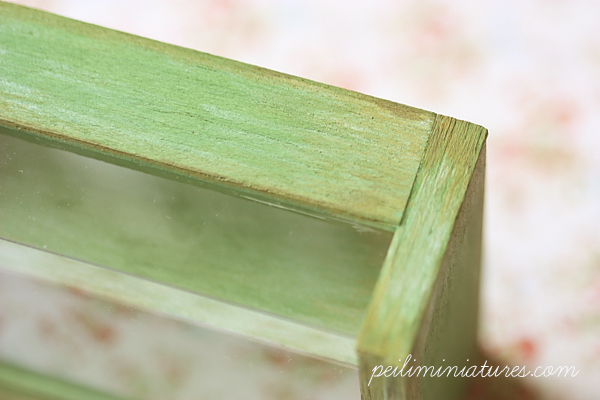 I was really curious to how the quality is like, so within a day or two, I experimented it with my cake shelf. The texture is really creamy and smooth, which is really good. It can be a little thick but I just thin it down with some water and it is fine. :) The texture won me over. I painted a few coats on my cake shelf and when it's dried, I started to see the noticeable difference of this paint versus the other brands of acrylic paint. Other acrylic paints are just matte, which means there is no difference in its look except for a coat of colour. But for the Martha Stewart Satin Acrylic Paint, I saw a sheen of satin glow. This is very apparent when you tilt your item and see it in daylight. It is absolutely gorgeous to me, and I was completely bought over by it. This is my newest pink macaron necklace! I don't know why it took me that long to come up with a pink theme - knowing it's my favourite colour, but late is better than never! This brings a smile to my face. I was picky with finding the best pink combination, and this is just one of them. I MIGHT come up with more pink combinations. Oh, if you have anything in mind, do let me know too. If you are still reading this, GOOD. November is a special month for me always. Thanksgiving is just around the corner, and I want to thank you all for the continuous support shown to me. I'm excited to introduce you my newest miniature clay food workshop entitled My Christmas Treats! I've been slowly working on this piece for a little while now and am truly excited to be able to offer this as a workshop now. Learn to create yummy christmas treats such as traditional fruit cake and stollen bread! And for this year, I'm also extending a special discount for my previous students who has taken workshops from me before. All previous students enjoy a 10% discount off the course fees for My Christmas Treats. If you have been following my Facebook Fan Page, you would know that I was running a free giveaway contest over the last week. Just a little while ago, I announced the result of the winner as well as the answer to what I was making with the miniature cups! I have soo many new stuff in the pipeline but I am waiting to complete my mini scene (I'm waiting for another supply to come in) before I present the whole idea. Stay tuned! This christmas ring is newest in my collection. 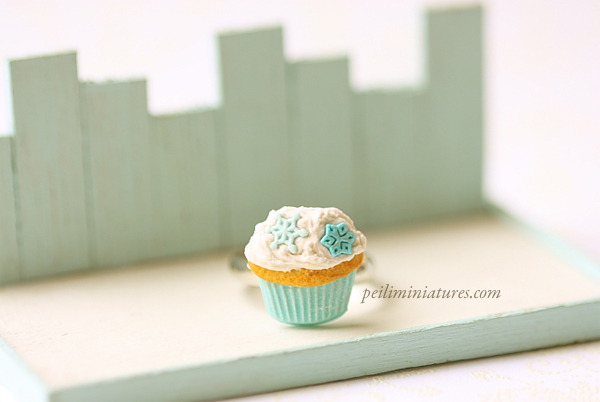 I love tiffany blue colour so much that I had to make a christmas theme cupcake ring with it. Now available in my shop under food jewelry section! November arrives....which means it's also my birthday month! I've not been hosting any giveaway for quite a while, and this is quite timely. So please head there if you want to take part in the free giveaway contest! * Please click Like and Share. * In the comments, please enter your answer. I will pick a winner on 6 November. The first person to guess correctly will win. Please note that if I cannot contact you on Facebook, I will pick another winner. I'm excited to show you this batch of handmade christmas ornaments that I made. My customer wanted christmas ornaments to be made with these faux macarons, and I happily whip up a batch! These are going to new homes! Hope their new owners love them! I'm currently hooked watching this korean drama series....just because it has a cake and pastry chef theme. The cakes are beautiful and some are cute. The panda cafe has a lovely and homely charm to it. 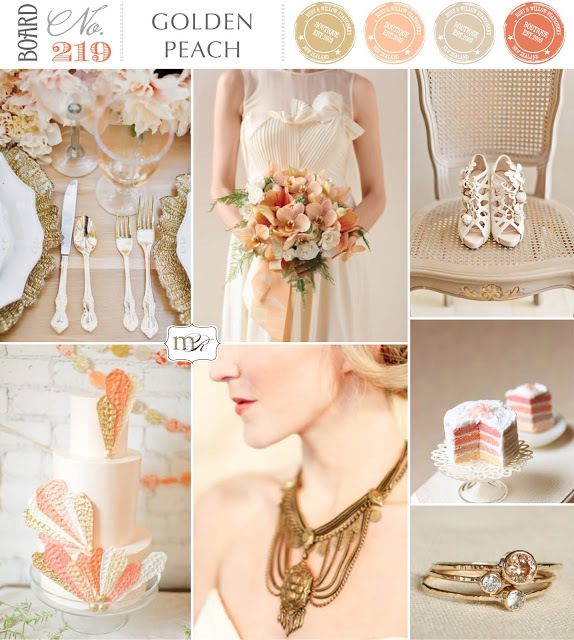 It's one of my favourite blogs to look at when I want to be inspired by colours and ideas. And today I feel so honored and privileged when I saw my own dollhouse miniature pink layer cake being featured in one of their colour inspiration board. Being featured on their blog means a lot to me because I had been admiring their style for the longest time. I love this colour combination so much that I had to share. 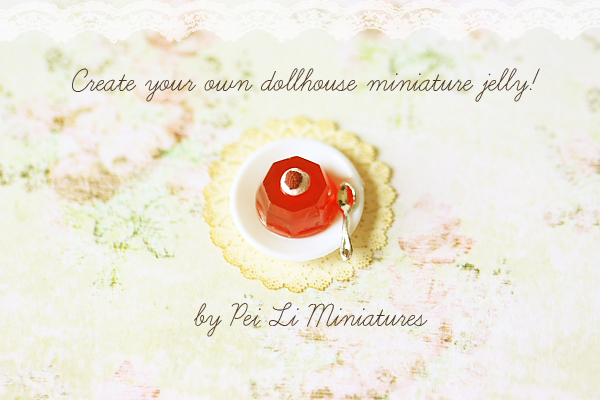 These are my newest dollhouse miniature cake pops in 1:12 dollhouse miniature scale. Fascinated with the blue colour lately, I went onto a craze and made these blue shades cake pops! So serene and peaceful, I hope you'll like them! 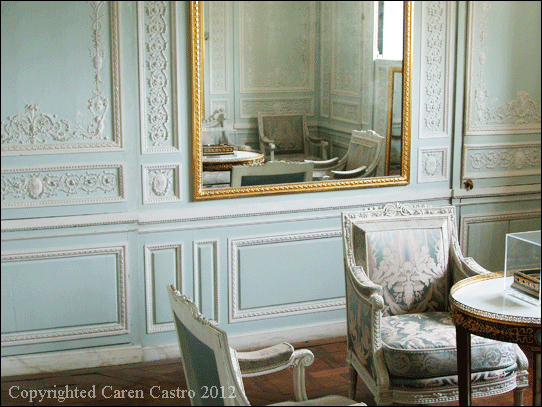 If you wondered where I get my color inspiration from, I get them from almost everywhere. I just pay attention to a lot of things in my day to day life. Just the other day, I saw my mom's shirts hanging on the clothes line and immediately I saw that those colours were complimenting one another and she just happened to have her craze over purples and brown. 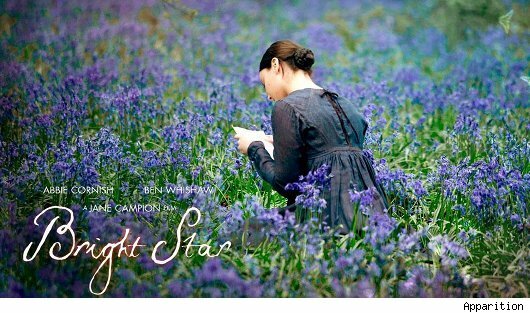 2 nights ago, I was watching a film and by chance, I picked Bright Star. The reason was rather superficial, I'll admit. I was lured in by the protagonist's occupation, who was a stitcher - she stitches and hand sew her clothes. Another reason why I picked to watch this was because I was lured in by the photograph below. The colours in this film is just amazing. The story is OK, but I love the clothes, fabrics, colours and the set. Just by looking at it, you can tell a lot of effort was being put to ensure that the audience is in for a beautiful visual treat! I can't even describe it to you, but I have not seen such a beautiful film for a very long time. At times, there were very dark rich colors, and at times, they used very soft feminine colors. I think I want to re-watch this again. I'm in love with this neapolitan macaron necklace! I just enjoy spending time fine tuning and coming out with different colour combinations, as you can see. I've designed these faux macaron jewelry which are now available as pre-orders for christmas jewelry gifts! I still can't shake off the macaron fever and have continued to come up with more macaron jewelry designs. And of course, because the holiday season is fast approaching, I wanted to do something cheery and festive. My friends are so used to seeing my miniatures that they naturally thought these were dollhouse miniatures until I told them these were life size fake macarons. Each macaron is about 4cm wide and about 1.5cm thick. For the entire month of October, I'm accepting these pre-orders for a special discounted price! I personally know how hard it is to shop for unique, meaningful and something special for christmas, and I think these will definitely delight your family and friends. Just remind them it's not edible! You can order these fake macarons jewelry at my shop here. Ok I wished they released these fabric prints on their own, because I dream about making curtains with them. But unfortunately these prints are only found in their patisserie de paris range of products. Although I would never be able to wear that cute dress / skirt and carry it off well, but it doesn't hurt to look at it. I imagine those working in a cafe or into cosplay would love that. BUT there are still other products that one can dream about owning, like the pouch bag and tote bags! This dollhouse miniature brick wall has taken me a bit way too long to make. I was over ambitious and started off with a larger surface area, and after making 3 or 4 rows each time, I would get really tired. It can get pretty time consuming to make, and I had to break it up into several sessions. And then real life and other work got into the way and so I kept putting this project aside. But a few days ago, I saw that I only have another 3-4 rows before completion and so I pushed myself to finish it. I am really glad that I finished this wall finally. I initially wanted this to be part of the feature for a future workshop, but experiencing how tedious it can get, and based on my teaching experiences so far, I have decided to tweak it down. My initial plans will be changed, but I believe it will still be good :) And for this wall, I will keep it for display purposes. I love how life gives us lots of inspiration everyday. It is also the first time for me to create a jewelry using a different colour line, but I am really loving it. Perhaps it's the brightness of it. My mom actually loves this colour range. I just like how these colours compliments so nicely. What other bright trio colour combinations would you like to see? It's been a while since I worked on something new in 1:12 dollhouse miniature scale. I have been still busy with real life and work, which inhibits me from doing more experiments. Most of my free time are spent working on large wholesale orders (thank you!!) as well as refilling my shop for those items that I sold. Whatever little time and energy that I have and can squeeze out from my busy schedule, I try to experiment something new. I made these new 1:12 scale decorative kitchen signs just the other day, and I'm so happy with how they turned out which made me feel really excited to launch them in other words as well. So please keep a lookout in my shop as I will list them when I finish some. I made them entirely by hand, and I love how they look with the white-washed wood backing. Off to make some more! 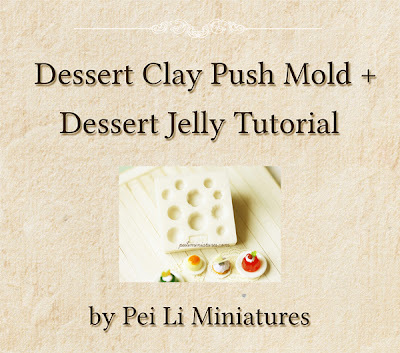 I've finally completed my latest clay sweets tutorial and it's now available in my shop as a bundled purchase! 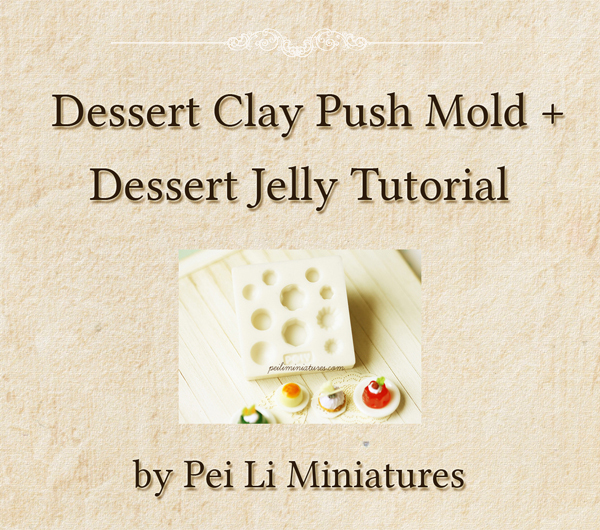 In this bundled purchase, you will get the dessert jelly tutorial as well as the dessert clay mold. It took me some time to write and compile this, since I am quite selective when it comes to photos and making sure the whole tutorial gels together and folks can understand what's going on. Learn how to create your own dollhouse miniature jellies! These are the newest dollhouse wall art that I did recently. I made some of these sometime back, and the last set that I did were actually winter flowers. I did not finish making the whole lot since there were just too many photos, so whenever I have some time, I will pick some and work on them. This batch of dollhouse wall art are skewed towards orangey, peach flowers. You can find them available in my shop under dollhouse miniature accessories. Don't be misled. Simple questions that empower buyers. Recently I was alerted about a reseller who stole my photos and content. She used it on her website and etsy shop. I decided to write about this, in order to raise awareness amongst buyers regarding the issue of misleading photos that are sometimes used. I want to focus on the deeper and higher meaning behind this whole issue, as it is one that buyers should be acutely aware of. We have all had experiences buying things off photos that were misleading. Once I purchased some glass jars on Ebay. Photos are important to me, since I don't have the means to view the products in person. However when they arrived, I was sorely disappointed. It was nothing like the photos. The containers did not fit the jar openings nicely and they looked badly made. I asked for a refund because they were nothing like the ones that I saw in the photos. The photos were mis-leading. In today's world, supplying the products is just not enough, people are looking for value added service. How you create meaning in the products you carry is important. How you present them as they are is important. While price is important, so is reliability. - Sellers who present the item truthfully as it should be. No mis-representations. - Sellers who spend time to experiment and research products, and takes pride to create photos and write a proper listing description for the product. And while reliability is important, trust is sacred. Can one really trust a seller who steals content (which includes writing) and photos and as a result mis-represents themselves? Even if the seller is selling a raw supply, but took someone's photo to show the products that were created with the raw supply, it is still a case of mis-representation because the seller did not create that. - Did the seller use the product himself or herself? - Did the seller make their own notes about what worked and what did not worked? - Did the seller think of creative ways that you can use the product? - Did the seller show you how to use it, in his or her own way? These simple questions set a conscientious standard which you can apply. Applying these standards should help to protect you as a buyer. I hope in some small way this blog entry will serve to raise awareness on this issue. Some of you might think it's a really bold, and perhaps an acquired colour. I cannot even explain how beautiful this green is to me. And I think that even the pictures are not doing enough justice. I just know I cannot take my eyes off it. 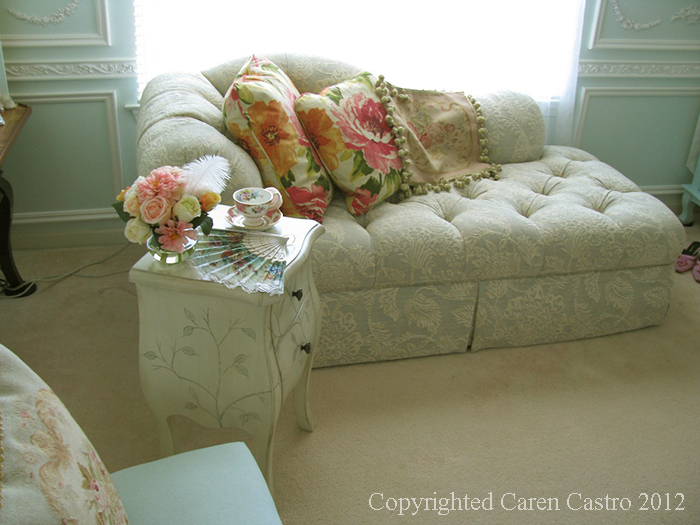 Very antique, elegant, and it makes me smile. I love everything green, even my food. Green cakes, green coloured drinks!! And then I went into elementary school and I think my colour taste changed as I turned 8 or 10 years old. I was really eager to try it, and here this is my first result. This piece is painted in many layers, to give it this antique look. I took this side view of it just to show you how straight the corners are. And a close up of the painted dollhouse cake shelf. Another shot of the sides. Available now in my shop here under Bakery Miniatures. But today, I was very happy to go flower shopping with my aunts and mom. I needed some flowers for my project and had to shop for some. These are the ones I bought, and I hope I would be able to use them well in my project. It's very rare that my mom comes along with me to my craft shopping in Singapore, but she has excellent taste. She eyed this bunch of pretty flowers first, and I liked how it matches my project! This is also another bunch that my aunt probably saw and thinks it would be a good fit for my project. Can't wait to use them...but first I still have more work to complete, and after a good rest, I shall start working with these flowers. I'm still busy working on these fake macarons. This batch is coffee flavour ones. I have to keep stressing that it's fake just so that people don't think they are edibles. I did not know this flavour or colour is such a hit. Perhaps people really love drinking coffee and it doesn't harm to have a coffee macaron too? Before I started getting busy with the macarons, I was also busy working on my second online tutorial! YESS! For those who are searching for online miniature clay food tutorials, I am working on the second one, but I got pulled away by a project so I have to devote my time on that instead. But I just wanted you all to know there is something in the pipeline...so do look out for it. I'm welcoming my first overseas student this coming weekend, and it's always exciting! 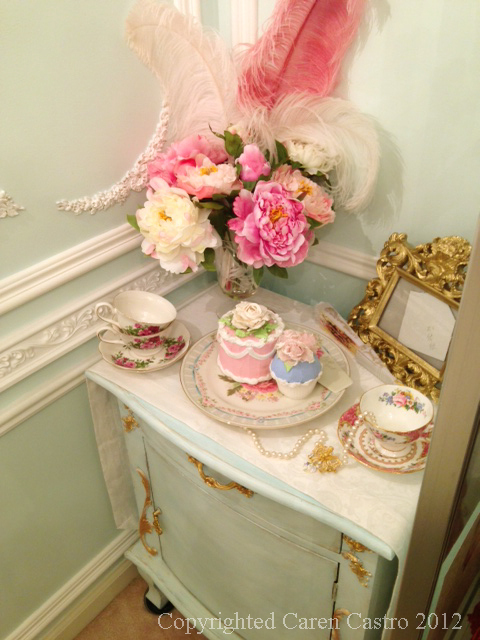 She wants to learn the English Tea Time which is one of the most popular workshops.